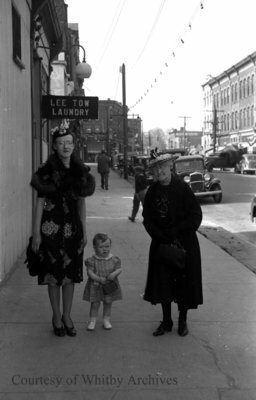 A black and white negative of Dorothy (Rice) Larkin, daughter Frances Larkin, and Mrs. Irene Rice standing on Brock Street South in Whitby, Ontario. A sign for Lee Tow Laundry can be seen in the background. Dorothy (Rice) Larkin was born on 10 March 1915 to Frank J. Rice and Irene Evelyn McGregor Rice in Whitby, Ontario. She married John B. Larkin and together they had three surviving children: Frances, Linda and John. Mrs. Larkin died on 15 May 1978 and is buried in Union Cemetery, Oshawa, Ontario. Rice Family, c.1937, Marjorie Ruddy. Whitby Archives A2013_040_671A.